Twin sons of staff member Reeve Deason with black lamb on lower ranch, circa 1951. 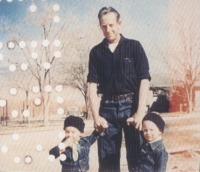 Reeve Deason standing with his twin sons outside on the main lawn circa 1951. Boarding House in background. Unknown what his job at Deep Springs was. Ranch staff at lower ranch with stake bed ranch truck. Left to right - Reeve Deason, Joe Gonzalez, Wayne Rupp. Unknown what their jobs were. Ranch hand Merritt Holloway sits overlooking Grand Canyon during student trip. Unidentified at right. Doug Powell resting on skis with unidentified student during winter snowpack survey in White Mountains. Doug was professor of geology at the time. Bjorn Halvorsen riding horse Dan in foothills.